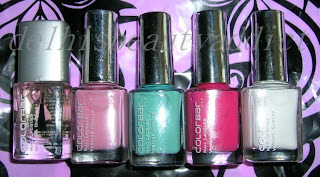 I really like the quality of these Colorbar nail lacquers. They have a nice sheen and dry in a jiffy. Priced at Rs.125, I think they are much better than Revlon nail polishes (why's their quality bad in India??) and without a doubt better than Lakme nail polishes - in both quality and price. As there's no Essie in India, let's just hope the next best things will suffice. Which one looks more like Essie 'Mint Candy Apple'? Hey! I haven't heard of this brand before, yah, packaging wise these look very similar to the Essie ones! 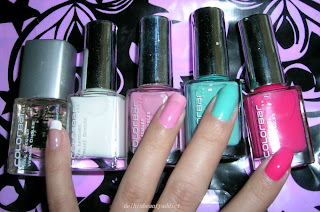 I'm loving the shades in pink and mint, oh I so wanna try out this brand! where do they sell? Although I am a big fan of colorbar but I guess they are juct copying everyone around. Their blush- Trace Gold is Mac's trace Gold Copy. Same goes with expensive pink and alike eye shadows. Who cares actually? I guess colorbar is far better than Lakme and many other brands around. so defo a dupe sweety! AHHHHH I love the green one!! Neverheard of colorbar before but damn they have some nice colours there. Hey! Great post! Really enjoyed reading it... and thks for the mint/jade dupes.. I have been looking for one since quite some time, but frankly never got the time to actually get down to doing it.. Really liking the mint & fuchsia pink on yr nails.. pretty, pretty..
OMG, what a coincidence that we've both featured the same nail colour on the same day! Ha ha! Too funny! I too have never heard of ColorBar before. 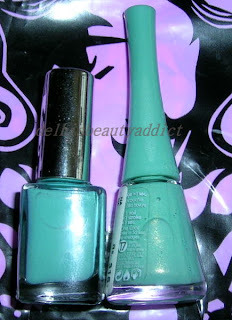 I have a couple of the Bourjois 1 Seconde ones, but I've never seen it in this mint green colour before. Seeing that montage of celebrities with this nail colour, I must say that it goes very well with a black outfit! I've never known that Bourjois HAS nail polishes! I love the jade color but there's no way I'm gonna wear it. I'm just not bright nails kinda girl. Gorgeous colours, I think they're quite good dupes for the Essie ones! 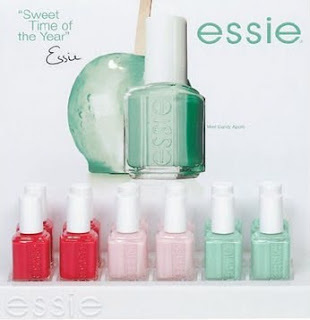 I bought a mint green nail polish the other day, I've still to try it but I hope it's a good dupe for Mint Candy Apple. I think it's so pretty!